“It is no wonder that so much of the search for identity among American Negroes was championed by Jazz musicians. Long before the modern essayists and scholars wrote of racial identity as a problem for a multiracial world, musicians were returning to their roots to affirm that which was stirring within their souls.” – Dr. Martin Luther King, Jr.
Martin Luther King, Jr. was assassinated 43 years ago today in Memphis, TN. Though I was not quite eight years old at the time, my recollection of some things about that day are still quite vivid. My parents were tailors who ran their business out of the basement of our Long Island home. I remember them working that evening at their sewing machines, which sat at right angles to each other. I sat with one of my coloring books and my Crayolas at the massive cutting table in the center of the room, working on my latest masterpiece. 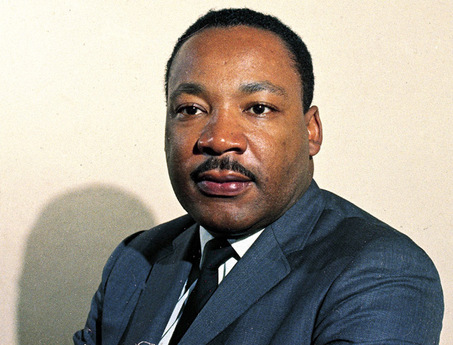 WGLI, the local top 40 radio station, was playing on the AM table radio on top of the fabric shelf, when the deejay broke in with the news that Dr. King had been shot in Memphis. Both of my parents stopped what they were doing. My mother spoke first, saying to my dad “John, did you hear that?”. My father immediately went to the radio and switched it to WINS, the all news station. By the time he got the New York City signal, the news had gotten worse. Dr. King was now dead. My dad was a stoic man. In his era, men did not display great emotion. Though he laughed easily, tears were just not an option. So, as my mother cried out “Jesus!”, my father quietly uttered what for him, was a wail of grief: “Ummf, Ummf, Ummf…”, each one with increasing emphasis. We had no TV in the basement workshop. But neither of my parents moved yet to go upstairs and turn the TV on. They seemed to be hoping that if they remained in the basement long enough, somehow when they did go upstairs, Walter Cronkite would make the radio out to be a liar. By now, my mother was working the phone, calling friends, neighbors and relatives and checking to see if they had heard the news. My dad had sat back down at his sewing machine and he tried to return to work. I saw a little tear form in the corner of his eye and make its way silently down his cheek. I knew of Dr. King. I knew he was a great man, because my parents had told me so; but at this point, he was still years from having a profound affect on my life. I was seven; all I really knew is that I had never seen my father cry. So, I asked my dad what was wrong. He just responded gently “Nothing…I’m alright, Curtis…” and his voice trailed off. A few minutes later he shut off his machine, went upstairs and turned on the television. He would not return to the basement that night. Dad generally worked seven days a week, from 7 a.m. until the end of the 10 O’Clock News; this was major indeed. By the time of Dr. King’s funeral a few days later, the small black and white TV had been moved to the basement. My dad had gone to great lengths to set up the antenna to get reception. I don’t know if it was Easter Recess or not, but I remember being off from school that day. My parents tried to work but couldn’t, as they watched the scene play out in Atlanta. My mom cried throughout the service. My dad maintained quiet composure until the portion where they played the excerpt from Dr. King’s final Ebenezer sermon (“The Drum Major Instinct”). At that point, he began to weep openly. Over the years, I’ve become a student of Dr. King. I’ve read and researched copious amounts of information concerning his life, his ministry and his work. I did this because I wanted to know about the man, warts and all; not the deity that our society has created. Frankly, the more I’ve gotten to know about his successes and his shortcomings, the more my admiration for Dr. King has grown. One thing I did not learn until a few years ago was that Dr. King had a great respect for jazz. When asked by an acquaintance, he penned some eloquent and profound words that were used as the foreword to the program from the 1964 Berlin Jazz Festival. This entry was posted on April 4, 2011 at 3:38 pm and is filed under The Jazz Continues..., Uncategorized with tags 1968, April 4, Billy Taylor, Drum Major Instinct, jazz, Martin Luther King. You can follow any responses to this entry through the RSS 2.0 feed. You can leave a response, or trackback from your own site.